Genealogical records are located on the 2nd floor of the Fairfield County Museum. This library is an excellent source for research and historical materials about Fairfield County and the families that have resided in or passed through the county on their way South and West. A large and diverse collection of materials, including legal documents and personal records, is available to the public. Research assistance (sponsored by the Fairfield County Genealogy Society volunteers) is available during museum hours. Queries can be emailed in. There is a small fee for non-members of the society. www.fairfieldgenealogysociety.org Also on FaceBook. This facility is covers South Carolina, specifically Fairfield County. Hours are Monday, Tuesday, Wednesday, Friday, 9 am-6 pm; Thursday: 9 am-9 pm; Saturday: 9 am-1 pm. No paid researchers. The museum is a three-story 1830 Federal-style former home and ladies’ boarding school that was run by Catharine Ladd (1850-1870). Now a museum of local history, it houses collections spanning the area’s pre-history up until the early 20th century. Please call for information on current and upcoming programs. Genealogical records are located on the 2nd floor. Free admission. Open for tours: Mon–Fri: 10 am–5 pm, Sat: 10 am--2 pm. I-77, exit 34 or 48. Address mail to P.O. Box 6, Winnsboro, SC 29180. Follow the museum on FaceBook, also. Check out the film series based on the museum’s award-winning oral history project here. This facility covers Great Falls & Southern Chester County, along with the Catawba River area. Hours are Monday, Wednesday Thursday, Friday, 8:30-noon; and 1 pm-5 pm; Tuesday: 1 pm-7 pm. Closed on Saturday & Sunday. No paid researchers. Take a step back in time with a visit to the Boykin Mill Pond community where grain is ground at the restored mill or watch as brooms are hand-made on 100 year-old original equipment at the Broom Place. Home of the Battle of Boykin’s Mill, this location has been named one of the top 10 Carolinas’ Civil War sites by Clint Johnson in his book, “Touring the Carolinas’ Civil War Sites”. Nearby is Swift Creek Baptist Church where generations of worshippers lifted their voices in prayer and Boykin Mill Store. Groups welcome and tours available. The Historic Camden Foundation is a private 501(c)3 non-profit museum whose mission is to protect, preserve, and celebrate Camden’s extraordinary Colonial and Revolutionary War history. 107 acres sit atop the original 18th-century property of the city’s founder Joseph Kershaw and the fortified Revolutionary War-era town occupied by British General Cornwallis and Lord Rawdon’s men from 1780-81. General admission and self-guided tour prices are available on the website. Hours are Tue-Sat: 10am-5pm; Sun: 1-5pm. Closed Mondays and major holidays. Guided tours at 10:30am and 2:30pm. John Craig, Esquire, whose family originated in southwestern Scotland, immigrated to South Carolina from Northern Ireland in 1772. After receiving a land grant in Lancaster County from King George III, Craig bought this land in 1773. John Craig, Esquire and several of his sons fought in the Revolutionary War battles that occurred in the vicinity. The current Craig House dates from the early 1830s, and was originally a federal-style farmhouse. In 1901, it was significantly enlarged with a Victorian front addition by John Edgar and Amanda Drennan Craig, who were married in 1883 at Kilburnie, then the residence of the Drennans. Craig House was listed on the National Register of Historic Places in 1989. The fields and woods surrounding historic Craig House are all part of pre-Civil War Craig Farm, which included more than a thousand acres. Craig Farm today consists of close to 400 acres and is operated as a cattle farm. Built on a hill, Historic Downtown Chester offers a unique blend of architectural styles, with many original Victorian-era facades. Monument Square features a stately Confederate monument, 19th century cistern designated a national landmark, authentic Civil War cannons and the historic Aaron Burr Rock. The nationally registered Historic District is composed of numerous churches, homes and other buildings. Walking tour brochures are available in boxes throughout town for visitors who want to explores on their own. Revolutionary War historical sites abound, including the county's Old Catholic Church and Cemetery, where 60 Revolutionary War soldiers are buried. For more information, contact Chamber of Commerce or Downtown Development Association. This facility serves as the county’s archival repository and provides opportunities for genealogical and historical research. 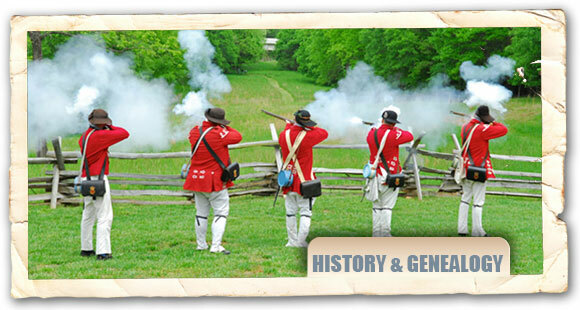 It is also home to the Southern Revolutionary War Institute. Open 10 am–4 pm Mon–Fri and the 2nd Sat. of each month from 10 am-4 pm. Research is free for York County (SC) residents. There is a $5 research fee for out-of-state residents (inlcudes 4 copies of document and postage). The society houses exhibits focusing on the county's history. There is also a gift shop, and a museum. Mon-Fri.: 10am-4pm. Located in the Chesterfield Visitors Center (Old Chesterfield County Courthouse). Believed to be Lancaster’s oldest surviving home, (c. 1828), Kilburnie--originally located downtown Lancaster-- was saved in 1998 from the wrecking ball and moved over three miles to historic Craig Farm where it underwent extensive restoration. Kilburnie’s rich history and architectural significance warranted the enormous and expensive undertaking. The quality of the restoration is best reflected in the intricate ceiling details of the Kilburnie's public rooms accomplishment by nationally known local artist Jim Shore, who also painted portraits of Andrew Jackson, George Washington, William Richardson Davie, and other pictures gracing Kilburnie's walls. Built in 1828, this facility is a significant work of Robert Mills who is best known as the designer of the Washington Monument. The courthouse had been in use as the county’s courthouse for over 180 years until an arsonist attempted to burn the building in August 2008. The courthouse was renovated to its original grandeur and now houses the Lancaster County Welcome Center & Gift Shop and the county's Historical Museum, open Mon-Wed-Thus: 10 am-2pm, other times by appointment. Designed by Robert Mills, this facility was completed in 1823. The downstairs cells were meant to hold debtors, a practice that soon waned. In 1965 soldiers under command of General Sherman tried unsuccessfully to destroy the jail. Listed on the National Register of Historic Places, it is the only known example of Mills' use of medieval design.